Bike icons for the Tire Pressure App I'm finishing up with Edison-Gauss. Raleigh Superbe utility bike, Rene Herse randonneur, Speedvagen race bike, Pereira longtail custom. One of the E.g. programmers owns the Pereira longtail. I think the Randonneur could have wider tires, but I'm happy the cargo bike's tires look like Schwalbe Big Apples. As they should. I took a few liberties with the way a redwing blackbird wing actually looks, since I wanted the overall feel to be more like the bird itself. I tweaked the capitals a bit, especially the "T."
DTS Overland is a backcountry tour company in Bend, OR. DTS Overland Tours and Adventures, LLC. I drew each element on a separate sheet of paper for ease of layout in the computer. It's all vectorized in Illustrator and laid out in Photoshop. 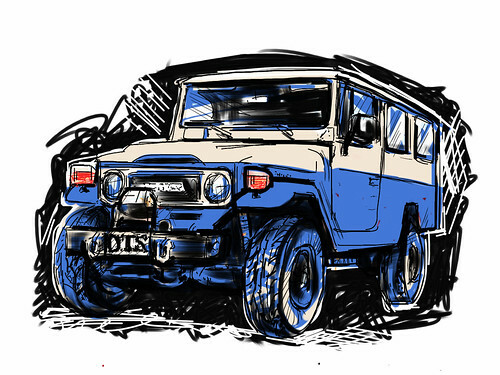 The door graphic will go on coyote tan Land Cruisers, and the main logo (with the FJ80) will go on everything else: tee shirts, flyers, and children (if they stand still long enough). For the mobile templates we're building, I tried out some 'toy store' specific icons, but generic ones made more sense for the budget and timeframe. Vector illustration in Photoshop. The face is done with layer effects to get the 'inset' look. It helps the face read better at tiny sizes, too. Working out an idea for a Backcountry Tour company logo. Sketchbook Pro is pretty cool, and I like the Targus stylus I bought to replace the Griffin. I didn't like the short barrel of the Griffin, and it only lasted three days with an 11 year old playing Fruit Ninja before the tip tore badly. 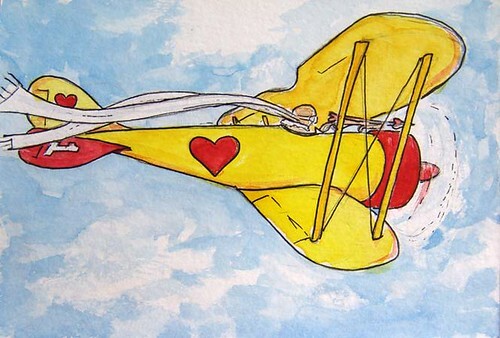 Love Plane 01, a photo by BikeTinker on Flickr. pencil drawing, traced in Illustrator. The Cobra tire tool instruction pictures weren't clear enough for me to understand what made the tool unique, so I made my own drawing. I'm making drawings to explain simple bike stuff, without getting hung up on the drawing too much. This is the original for the Instructable on how to reuse a cassette cog. A pencil study (with digital rectification) for a poster of old Zeiss lenses one can use with Olympus PEN Sony Nex cameras. I've had this lens for a long time, and exposed a lot of film with it. It feels really natural to use it on a digital camera, and it made me realize that the lens makes the image. A camera is just a light-tight box. Old manual prime lenses are great choices for newer large sensor LED digital cameras like micro four-thirds (m4/3) and the Sony Nex. Adapters are available for many lens mount standards, and most cost about $30 on eBay. Legacy lenses act like longer lenses on digital cameras, because the sensors are smaller than a 35mm negative and cut a smaller rectangle out of the lens image. A micro 4/3 sensor is 1/4 the area of a 35mm negative, half as tall and half as wide, and effectively doubling the length of the lens. The Nex is about 1/2 the area of a 35mm frame, so its apparent magnification is 1.5, and a lens is equivalent to one half again as long, instead of double the length. Because of that effect, 58mm Zeiss Biotar acts like a 116mm lens on the PEN, and like an 87mm lens on the Nex, which is a nice portrait length. The 75mm Biotar is a legendary lens, and goes for ~$800 on eBay. This little guy can usually be had for ~$50. The only lens I like better than this one on the Sony is the Angenieux 135.
cat sketch, originally uploaded by BikeTinker. St. HST, originally uploaded by BikeTinker. I'm working on a series of prints of dead celebrities whose work I identify with. 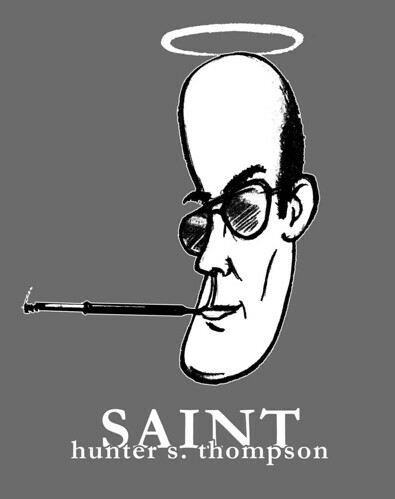 People who are not necessarily considered saintly, like Johnny Cash, Joe Strummer... and Hunter S. Thompson. December 4, 2010 - 1 comment. Watercolor over pencil. I like this technique for the control I have, and the speed I can work at. Dirt Rag magazine commissioned it to promote their 20th anniversary in 2008. Twenty year old magazine, twenty year old bottom bracket, both legendary and long-lasting! This painted and cut-out gouache on paper character goes with a Machine Mask sculpture I made from an old adding machine. My Machine Mask sculptures are cast-off objects of the Industrial Age (vacuum cleaners, gas cans, adding machines) that I paint eyes on to create tribal masks. Concept sketches for game demos and a PlayStation2 environmental interface. a PSP side-scroller called "Wren 66" where you fly your way through the vast and hostile mining infrastructure of Mars with a tiny jetfighter. a game using an exercise bike to control your flying avatar in a networked social arena. a roleplaying game called Stone Lords where you battle evil mind-controlling shape-shifters in flying cities. "Zero Hour," where you had to use construction machinery to clear a path for "the bomb truck." The first PlayStation2 demo disc interface. This has been a great bike week. Thursday - The Builder's Tour: ride with bike builders to visit other builders' shops. Friday - Bike Snob NYC linked to a picture in my flickr stream. A vector tracing of a pencil sketch, saved out of Photoshop at different sizes by changing the Image Size in the "Save for Web" export. September 20, 2010 - 1 comment. At LifeLike, we put together a demo of an interactive comic book for the PlayStation2. I designed the characters and the plot, and drew the storyboards. The scenes were built in 3D to match my layouts.